According to Talcott Parsons, the disengagement of the church from social life might not necessarily mean that the church is any less important at a social level. Parsons argues that societies evolve through a process of ‘structural differentiation’ – as societies become more complex, a greater variety of more specialized institutions evolved. Parsons accepts that religious institutions play less of a role in politics and in the socialization of children than they did in the past, but these functions are taken over by newly evolved institutions – such as representative government and education. Traditional institutions such as the church evolve to limit themselves to performing a smaller number of functions than previously, but these functions are still vital to the maintenance of the system as a whole. They form the basis of morality and the legal system – for example, the 10 commandments form much of the basis of the legal system in modern Britain. They help people deal with social changes such as the death of individuals – through providing rituals that help them cope with transition. This helps maintain social order. They help people deal with social contradictions – such as lazy people being rich… according to Christian doctrine, they will go to hell. For more on Parson’s functionalist perspective on the role of religion in society – please see this post. Links to other parts of the course…. NB – Parsons argues that all institutions undergo a process of structural differentiation. His view on how religion changes with social modernization is similar to his view on how the family changes – as outlined in his ‘Functional Fit Theory‘ of the family. This theory of structural differentiation is part of his general functionalist theory of social change as evolution. Does religion cause social change, or prevent it? Functionalists and Traditional Marxists have generally argued that religion prevents social change. Neo-Marxists and the Social Action theorist Max Weber have argued that religion can be a force for social change. There are wide variety of opinions with Feminist thought as to the relationship between religion and social change. Some Feminists tend to side with the view that religion prevents social change. Other Feminists recognise the potential for religion to bring about social change. This post considers some of the arguments and evidence against the view that religion prevents social change. Functionalist thinkers Malinowski and Parsons both argued that religion prevents social change by helping individuals and society cope with disruptive events that might threaten the existing social order. Most obviously, religion provides a series of ceremonies which help individuals and societies cope with the death of individual members. Marx believed that religion helped to preserve the existing class structure. 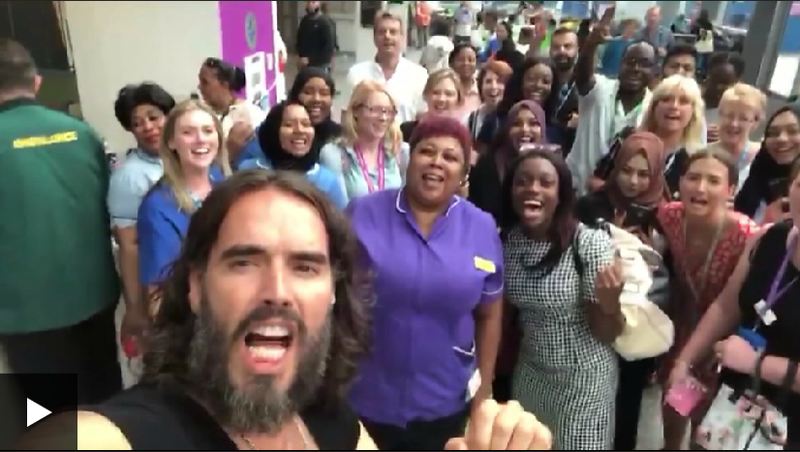 According to Marx religious beliefs serve to justify the existing, unequal social order and prevent social change by making a virtue out of poverty and suffering. Religion also teaches people that it is pointless striving for a revolution to bring about social change in this life. Rather, it is better to focus on ‘being a good Christian’ (for example) and then you will receive your just rewards in heaven. Max Weber’s ‘Protestant Ethic and the Spirit of Capitalism’ is one of the best loved accounts of how religion can bring about social change. Weber pointed out that Capitalism developed first in England and Holland, taking off in the early 17th century (early 1600s). Just previous to Capitalism taking off, Protestantism was the main religion in these two countries, unlike most other countries in Europe at that time which were Catholic. To cut a very long winded theory short, Max Weber argued that the social norms instilled by Protestantism laid the foundations for modern capitalism. Neo-Marxist Otto Maduro pointed to the example of Liberation Theology in Latin America to demonstrate that religion can act as a force for social change. He further suggested that this is especially the case where the marginalized have no other outlet for their grievances than religious institutions. Reverend Martin Luther King and the broader Baptist Church in the Southern United States played a major role in the Civil Rights movement in 1960s America. This movement effectively helped to end racial segregation in America and secure more equal political rights for non-whites. Martin Luther King was very much inspired by Gandhi’s religiously inspired practice of Non Violent Direct Action. This involved the use of peaceful protest and resisting of violence in order to bring about social change. The Arab Spring which swept across the Middle East and North Africa between 2010-2014 offers a more contemporary example of the role of religion in social change. Islamic groups were very active in using social media to highlight the political injustices in countries such as Tunisia and Egypt. This post is a work in progress, further details to be added in due course…! 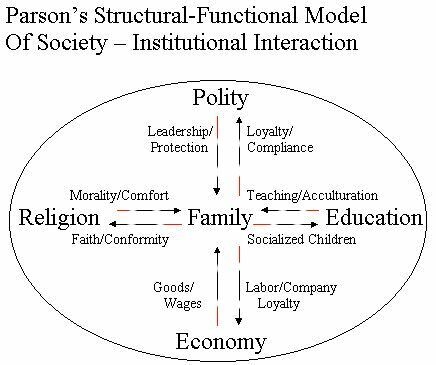 More than any other Functionalist, Parsons developed Functionalism as a ‘systems theory’: he understands the role of one institution in terms of how it maintains the whole system. You might find it useful to review his general systems approach to social theory here before reading the rest of this post. For Talcott Parsons, religion is one sub-system among many, and it performs vital but limited functions in the maintenance of social order. Parsons sees religion as part of the cultural sub-system of society and religious beliefs provide a guideline for human action which give rise to a more specific set of norms according to which people should act. ‘Thou shalt not steal’ forms the basis of laws against property theft. So for Parsons, religious belief provides a set of values, or general principles which form the basis of value consensus, which other institutions then reinforce in more concrete ways. Firstly, there are those occasions when people are hit by events which are totally unexpected and have a negative impact, the main example being premature death. In such situations, religion can help people make sense of these events and restore normal patterns of life. A religious belief in the afterlife, for example, offers the bereaved a way of imagining that their dead son/ wife/ friend is ‘waiting for them on the other side’, and so not really ‘gone’ forever. Secondly, there are those routine aspects of life in which people invest considerable time and effort in order to achieve a particular outcome, but are still characterized by uncertainty of outcome. Agriculture is a good example of this: several weeks or even months of the year might be spent sowing and tending crops, only for the whole harvest to be laid waste by droughts or disease. In such situation, religious belief offers an explanation for the disastrous outcome, helps people cope with the hardships with may follow, and helps to restore faith in the initial effort made despite said disastrous outcome. As with Malinowski, Parsons argues that religion serves to maintain social stability by relieving the tensions and frustrations that arise following such unpredictable problems. A third function of religion according to Parsons is that it helps individuals to make sense of experiences which are contradictory. Probably the best example of this is the way religion helps people to make sense of the injustice of people who profit through immoral behaviour – Christianity, for example, says that these people will reap their punishment in the afterlife, by going to purgatory or hell, while those who ‘suffer virtuously in poverty’ in this life, will reap the reward of heaven. Thus religion helps people to adjust to the various worldly experiences of inequality and injustice, again maintaining harmony. Haralamabos and Holborn: Sociology: Themes and Perspective, eighth edition. The Anthropologist Bronislow Malinowski is the third of ‘three functionalist thinkers’ it’s useful to know about for A-level sociology, the others being Emile Durkheim and Talcott Parsons. 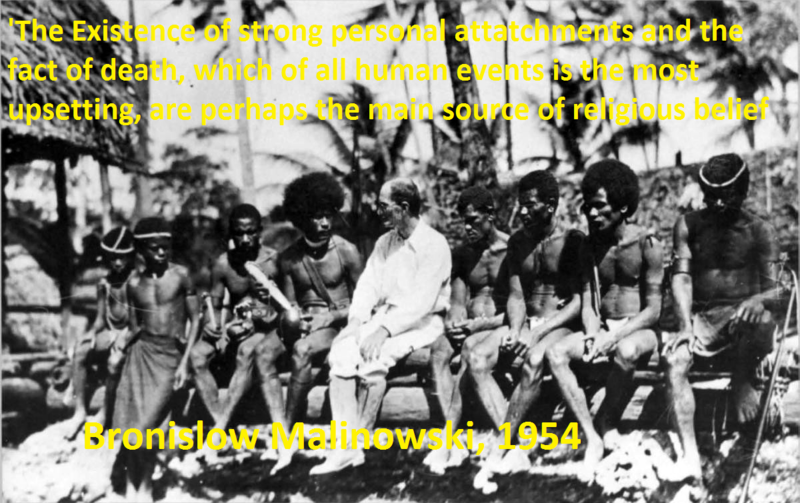 Malinowski was one of the founding fathers of anthropology, who lived as a participant-observer on the Trobriand Islands, in the South Pacific (near New Guinea) for four years between 1914 and 1918. He developed his theory of religion based on his observations of the role of religion in this one small-scale society. Malinowski argued that the main function of religion was to help individuals and society deal with the emotional stresses which occur during life crises such as birth, puberty, marriage and death. Death, for example, is socially disruptive, because it not only removes an individual member from the fabric of society, which potentially creates tension, it is also stressful for those with close emotional ties to the deceased, who may not be able to function efficiently for a period of time. Religion deals with the problem of death through both belief and ritual: a belief in the afterlife (common in many cultures) denies the fact of death and comforts the bereaved, while the funeral ceremony offers a chance for other members of society to comfort the bereaved with their physical presence and it may also act as a form of catharsis. The funeral is effectively an expression of social solidarity which serves to reintegrate society following the ‘stress’ caused by a loss of one its members. Manlinowski argued that a second function of religion was to help people deal with situations or events which could not be fully controlled or predicted. To illustrate this Malinowski contrasted the way in which two different types of fishing were conducted on the Trobriand Islanders (NB – it’s an Island culture, fish is a staple food): Inland Lagoon based fishing was a very different affair to deep-sea ocean fishing. Fishing in the calm, inland waters of the lagoon was very much a day to day, relaxed affair – there was a high level of certainty that fish would be caught using the tried and tested method of poisoning. There were no religious ceremonies performed during this type of fishing activity. However, when men went out to fish in the ocean, beyond the barrier reef, there was no certainty of getting a catch, this depended on the luck of a shoal of fish being present, and there was also the danger of death usually associated with going out to sea. During these times the Trobriand Islanders engaged in religious rituals to try to ensure a favourable outcome. Malinowski theorised that when people are in control of the situation (or at least feel they are) and can rely on their knowledge and skill to provide predictable results, there is no need for religion. However, when there is uncertainly and unpredictability and danger, people engage in religious rituals to try to ensure a particular outcome: these were social events which served to reduce anxiety by providing confidence and a feeling of control over the situation. The similarities and differences between Malinowski and Durkheim…. Like Durkheim, Malinowski theorised that the key role of religion was to reinforce social norms and values and promote social solidarity. Unlike Durkheim, Malinowski did not see religion as reflecting society as a whole, nor did he see religious rituals as involving the ‘worshipping of society’ – he argued that religion had a more specific function: that of reinforcing solidarity during times of emotional stress that threaten to undermine the stability of society. Haralamabos and Holborn: Sociology: Themes and Perspective, seventh edition (unchanged in the eighth!). The profane refers to mundane ordinary life: our daily routine/ grind of getting up in the morning, doing our ablutions, going to college, eating our daily Nachos, and doing the dishes. For Durkheim, Religion is the collective practice of marking off and maintaining distance between the sacred and the profane, which is typically done through rituals, such as those associated with the daily or weekly visit to the church or mosque: prayer is an obvious example of an ‘occasional (sacred) ritual’ is marked out from ordinary mundane (or profane) life. Importantly for Durkheim, anything can be sacred (or rather, a society can determine that anything is sacred): there is nothing in any object or action that makes it inherently sacred: anything can be sacred: not only churches, mosques, and religious books, but in some cultures, trees, or even rocks may be regarded as sacred. Durkheim believed that in order to understand the role of religion in society, the relationship between sacred symbols and what they represent must be discovered. A work in progress, to be updated shortly! Durkheim saw Totemism as one of the earliest and simplest form of religious practice. It is most commonly found among aboriginal peoples, such as the Australian aborigines, and North West Native American Indians, who have clan based societies. Durkheim used the totemic religion of Australian aborigines to develop his theory of religion. Aboriginal society was divided into a number of clans, and members of the clan had certain obligations that had to be fulfilled – such as mourning the death of other clan members or helping seek vengeance if another member was wronged by someone external to the clan. Each clan was also exogenous – people had to marry someone outside of the clan. Each clan had a totem, typically an animal or a plant which was represented by drawings or carvings made on wood or stone, typically linked to a ‘creation myth’ that explained the origins of that clan and linked current members into that history. The totem served to distinguish the clan from all other clans. To clan members, the totem was as sacred object, nothing less than ‘the outward and visible form of the totemic principle or god’ – their animal/ plant was sacred and the totemic representation just as sacred if not more so. Durkheim’s ‘big idea’ is that by worshipping the totem, clan members are actually worshipping society, and thus individuals are reminded that society is more important than the individual, which is essential in Functionalist theory because individuals are dependent on society. The reason why humankind needs a totem to worship rather than just literally worshipping society (or the clan in the case of Aborigines) is because the clan is too complex a thing for people to conceptualise – religious symbols are just much simpler entities to worship! Haralamabos and Holborn: Sociology: Themes and Perspective, eight edition. This is an example of a 25/30 answer to the above question, as marked by the AQA. This is a thorough account of a range of functionalist studies. There is sophisticated understanding of the material presented. Analysis is clear and the material is well explained using appropriate concepts. This conceptual detail in some evaluation is shown, although this is limited to internal evaluation between the various functionalist perspectives. Other perspectives are only briefly mentioned in the final paragraph. This could be developed further to show a clear debate between perspectives. The answer shows application of material from the item and also from the student’s knowledge. This is accurately applied to the question. The final concluding paragraph could be more developed. The brief points on Marxism and feminism could be developed throughout the answer rather then simply stated at the end. Analysis is explicit and relevant.